What you MUST do for your landscape in 2018 PART II. 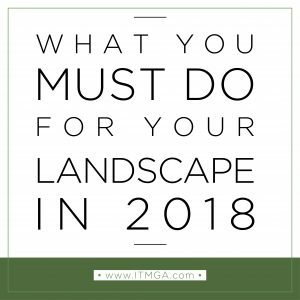 Last week we gave you the first three of six things you MUST do for your landscape in 2018 so today we will leap right on in to the last three. Determine what you want to invest in your landscape for 2018. Be frank with your landscape contractor if he or she asks what your budget is. There are usually multiple different ways to fix or improve your landscape and none of them cost the same. Being upfront with your budget eliminates wasted time and work for both the homeowner and contractor. It saves you time reviewing proposals that are outside of your budget and saves the contractor time in generating detailed proposals that will never turn into reality. It streamlines everything. Time is literally the most important thing we have in this world. Any good contractor who is aware of the investment you want to make will do everything in their power to maximize the value of your money. Think about it....if the landscape contractor doesn't know your budget, he may propose the cheapest option he can come up with, and while it may solve your problem or enhance an area you dislike, you could have gotten a much nicer plant package, a stone wall instead of a wooden wall or pavers instead of concrete. Maximizing the value of your hard earned money by providing the most bang for your buck should be a major priority of any good landscape contractor. Plan is in place. Problem areas identified. Budget is set. Next prioritize the areas in order of what is most important to least important and explain this to your landscape contractor. They will help make sure your order is right. Let's not lay sod this year and install irrigation next year. Why install a nice plant package in the back yard just to rip half of it out for a new deck later? Think about your end goal for your landscape and prioritize your enhancements accordingly. Check out this blog post for this final step. Everything you need to look for is right here. Some contractors charge a consultation fee. Do not be scared of a $50 or $100 consultation fee. Contractors that charge a fee to meet with you, talk with you, listen to you, measure, take pictures, type up a detailed proposal with project specifications and a sketch if necessary are the cream of the crop. In our experience they are the professionals that know what they are doing. They will have creative solutions for your problems and provide superior service. Imagine this for a minute...when you arrive at work, you begin your tasks, but you wait 4 hours before you start getting paid? No different than when a contractor arrives at your property, spends an hour with you, another hour measuring, two more hours at their office formulating your proposal and then another hour reviewing the proposal with you or making revisions. Take charge of your landscape in 2018 and reach out to us if you have any questions!